The moovePack tool allows you to easily offer your self-made actors, furniture, outfits, and decorations to other members. This tool automatically packs all necessary files into an MPZ package, which can be easily embedded into your website. Your site's visitors will be able to download and install this file with just one click. Please read the general notices and instructions for packing other files with the moovePack tool. Example: How do I create an MPZ file (using an outfit file [*.outfit])? Step 1: Open the moovePack tool (which you can find in your Roomancer installation folder) and then click on the "Outfits" button. 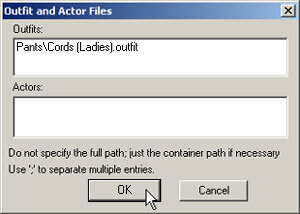 Step 2: In this window you can see two entry fields, one for the path/file name of the outfit (*.outfit) and the other one for the path/file name of the actors (*.actor) that were created with the Actor Studio. 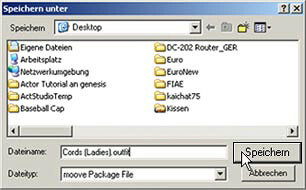 Since we only have one outfit file with the name "Cords (Ladies).outfit", enter the name of the subfolder of the folder "Outfits" from your moove Roomancer installation folder and the necessary file name. If you want to pack more than one outfit into an MPZ, please separate the entries in this field by ; (semicolon). Step 3: Now click on "Create Package" or on "File -> Create Pack" to create an MPZ file. Step 4: Now you will have to enter a name for your file and decide where you want to save it. You can add a digital signature to any MPZ file. The signature confirms the developer and guarantees to some extent that this package was created by a member and that the PC of other members won't be affected negatively. To get a digital signature, please contact support@moove.com. The digital signature can be entered and saved under "Edit -> Set Authorization". Under "Key File", you need to enter the exact path to your digital signature (*.private file). Under "Author", you enter your nickname (premium members please note: don't enter **), and under "Author's Info URL" you can enter the URL to your nickpage or website. You have your own website and don't know how to change your HTML code to be able to offer your MPZ files for download? Copy the following code and paste it into your HTML editor. Of course you need to complete it with your part of the source code, by adding more pictures and text, e.g., as you know from your previous HTML experiences. if(RoseCommand21.IsBrowserOnAdvanced() != 0) // Roomancer running? The line (img tag) where you can change the file name (picture) and the path to the MPZ file can be changed as often as you like, of course, if you want to offer more than one MPZ file for download. Just like you know from the moove shop, a single click on the preview picture will be enough to download and automatically install the MPZ file. Please also have a look at our instructions on how to create decorations and styles, if you wish to offer these files for download and automatic installation as well.